An interview with Ariana Grande’s fashion designer Michael Ngo for the Dangerous Woman Tour has been released by OUT magazine. 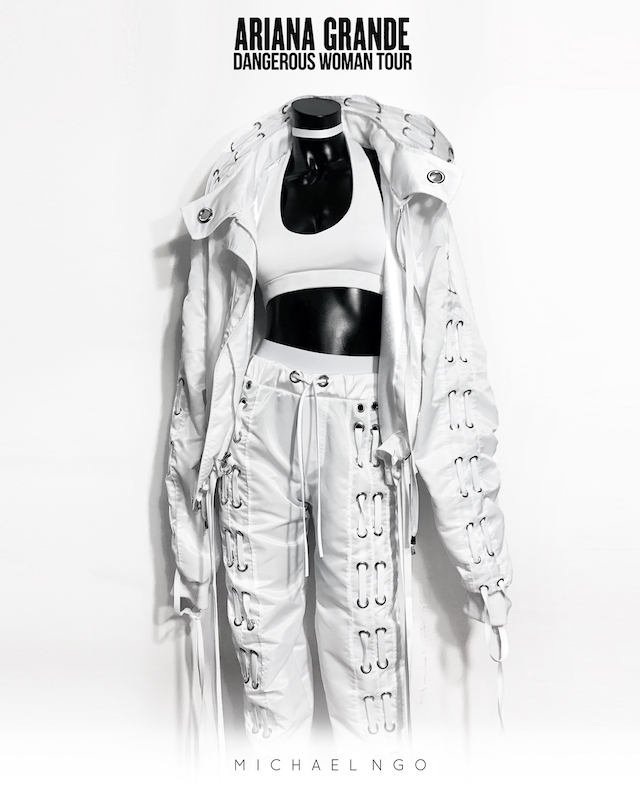 Equipped with a background in dance, queer LA-based designer Michael Ngo understands the complex needs of performance-wear—especially for a pop star’s global tour. Of course, style is crucial, and should translate to viewers deep in the nose bleeds; but functionality must also be considered, with garments that can endure a single show’s sweaty choreography, as well as months of the same hours-long set. For Ariana Grande’s 58-show Dangerous Woman Tour, which launched in February, Ngo was recruited to bring his urban-luxe streetwear aesthetic on stage, designing looks to echo the singer’s newly developed style. The designer, an alumnus of the Art Institute of Los Angeles, has previously dressed names like Lady Gaga, Kesha and Demi Lovato, so collaborating with Grande’s creative team was a natural next step. During the tour’s third act, Ngo dressed Grande’s back-up dancers for two of her biggest hits—“Side To Side” and “Bang Bang”—designing custom pink jogger sets, sporty mesh crop-tops and satin boxing shorts with custom embroidered patches that say, “DANGEROUS,” in all caps. OUT recently caught up with Ngo to learn about landing the gig, meeting tight deadlines and designing for the stage. OUT: How did you first connect with Ariana Grande? Michael Ngo: “Image Architect” Law Roach is the lead stylist for the Dangerous Woman Tour and he brought on celebrity stylists Joey Thao and iCON Billingsley as creative collaborators to execute the immense challenge of the world tour. Joey is a good friend of mine, who I work with closely for his clients, and Law had seen some of our previous work, so he mentioned my name as one of the designers to submit for the tour. Joey immediately reached out to me about this amazing opportunity—I was shook and that’s how the magical connection began. I couldn’t be more grateful. From your perspective, how do you see Grande’s personal style? I believe Ariana’s style has definitely matured during the course of the Dangerous Woman era and there’s been a departure from [the] coyness and cuteness of her past shows—there aren’t any cat ears to be found on this tour. She’s still very girly and playful, but her style is a lot more confident, fresh and a little bit, well, dangerous. To me, Ariana Grande is like this über adorable latex-wearing bunny, spreading her fierceness and fabulousness throughout an urban-pop jungle; she’s strong, defiant and isn’t afraid to make a bold statement about feminism, gender or equality through her music, performance and fashion. What was the process like working with Grande’s creative team on these looks? After Joey reached out, I was sent the vision board and treatment for the tour and immediately began sketching looks for Ariana and her dancers. We were on an intense two and a half week deadline before the first show, so I knew we had to work fast. I went through a few design edits with Joey before we submitted the final sketches to Law and Ariana for approval. When we got the green-light for the approved looks, I began the production process for the designs. I work independently out of my living room, which I managed to turn into my creative workspace and was able to knock out Ari’s look in a couple days, but I definitely needed some extra hands for the dancer looks. Luckily because of my amazing relationship with Joey, I was able to have him, and his assistant Lexi help my team—Carmen, Gee and Tamira—prep and execute about 80-something tour pieces. Did I mention 80-something pieces? What’s a tour without matching get-ups for the dancers, right? Was there a process for approving these looks? A week later, Law, Joey, iCON and myself flew out to Phoenix for the first fitting a week and a half before the show, where my look for Ariana was chosen as a select for the tour—once again, shook. To make sure everything was perfect and cohesive, Law made some final edits and revisions to the tour wardrobe before opening night and Joey, iCON, Law’s assistant Jerrica and myself were there to help support the vision. We share the same work-ethic, drive and passion to create, so working with these established individuals on such a massive project was an amazing experience of a lifetime. It’s hard to even express the feeling of accomplishment and pride we felt after seeing everything come together during the full dress rehearsal and then watching from the audience during the opening night in a sold-out arena. It was such an honor to be apart of Law’s creative team for the tour. What aesthetic was Grande wanting to achieve for the Dangerous Woman Tour? The wardrobe treatment for the tour was focused on monochromatic street-chic looks with a touch of ’90s flare. Ariana, Law and the creative team wanted to introduce new shapes and silhouettes, while incorporating some of her signature styles, like a-line skirts and oversized jackets. Each section of the tour had its own story, vibe and visual, so the looks were designed and placed respectively to bring each vision to life. How do these looks for Grande’s tour reflect your own aesthetic as a designer? When Law and Joey asked for a monochromatic streetwear outfit, I knew I would bring something cool, fresh and chic to the table. The Micheal Ngo urban-luxe street-couture aesthetic is infused in the DNA of the look and Ariana truly brings this vision to life. Something I’m known for and very proud of is technical design detailing and Ariana’s jacket represents that. The double-laces can be pulled and adjusted to give extra volume and ruching; the bottom skirt has a tear-away snap function to transform it to a short bomber; and there’s backpack straps built into to the lining, so that she could rock that off-the-shoulder look she’s into—it was one of the first things she noticed and said she loved. What do you have to consider when designing for performance-wear? As a former dancer, I understand that designing for entertainers and performers has to not only be seductive to the eye, but practical and constructed to allow movement and provide functionality. We added gussets and panels to all the dancer pieces, so that nothing would constrict their bodies and split crotch seams during a low squat or high kick. Performance-wear for a tour has be reinforced with snap support and hook-eyes to prevent wardrobe malfunctions. And in contrast, the clothes need to be able to come off in a matter of seconds so they’re designed for quick-changes by adding hidden zippers and snaps. Designing for a world tour, you also have to keep in mind durability of the garments for the duration of the shows. So fabrication and construction are key to making sure nothing gets damaged; and if it does, then there’s usually a set of duplicates as back-up.